As last year drew to a close, Namco Bandai finally excised the dreaded Games for Windows Live from Dark Souls: Prepare to Die Edition, migrating to Steamworks. Today, yet another spectre has been slain: the inexplicable region lock. With another foe put in the ground, the Knight of Namco Bandai mounts its steed, and rides off into the horizon. An update, which Namco Bandai has confirmed is from a developer, appeared on Steam today, informing players about a new patch that would remove the region restrictions as well as fixing a crash. 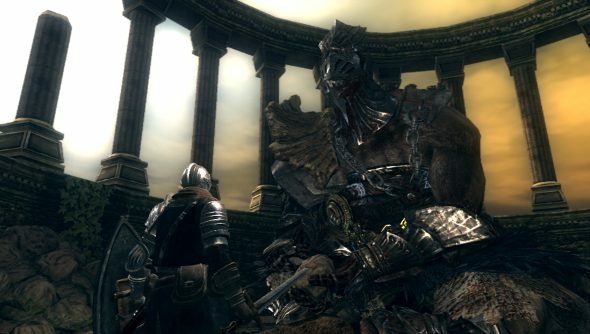 “A nice fix is available for all players since January 19th 2015 to completely remove the infamous multiplayer region lock in Dark souls: Prepare to die edition. This patch also fixes the crash that could occur when opening the Book of Guilty. To update your game, simply launch it from Steam with the auto-update option on. This means that you’ll now be able to team up with other players from around the world, instead of being stuck with people just in your region. Given that the game’s been around for a while and doesn’t have the player numbers it once did, this is a boon.